Blue Valley North hung on to beat Blue Valley Southwest 28-21 to earn a first-round home playoff game next week. The Mustangs have won four in row and improved to 5-3 with the win. Cole Chapman and Deion Lee highlighted the Mustang win with a 68-yard touchdown pass from Chapman to Lee. Hutchinson continued their winning ways with a dominant performance over Maize to earn their seventh win of the season. The Salthawks racked up 481 yards in their 40-7 win. Brody Smith led the offensive attack with 133 rushing yards and two touchdowns. Junction City erased a 10-7 halftime deficit to come away with a 20-13 win over Topeka Seaman. The Blue Jays scored twice in the third quarter and as the defense did just enough to preserve the win. Ryan Henington rushed for 149 yards and one touchdown and added a touchdown catch for the Blue Jays. Lawrence Free State routed rival Lawrence 56-7 to improve to 6-2 on the year. The Firebirds did their damage through the air as quarterback Dallas Crittenden threw for 257 yards and five touchdowns on just eight completions. Daniel Bryant found himself on the receiving end of two of Crittenden’s five touchdown throws. Mill Valley ended a four game losing streak in defeating Gardner-Edgerton 28-21. The Jaguars were led by running back Cameron Young and quarterback Brody Flaming who rushed for 144 yards and 132 yards, respectively. Young found the end zone twice for the Jaguars in the win. Pittsburg ran over Wichita North 50-6 to end the regular season at 5-3. The Purple Dragons scored on every possession in the first half except for a kneel down to run out the second quarter clock. In fact, the Dragons scored the all 50 points before North got on the scoreboard. Elijah Harris scored three times for the Dragons in the win. St. James Academy outscored Blue Valley West 36-30 to improve to 4-4 on the year. The Thunder rushed for 214 yards and two touchdowns in the narrow win. Clay Lautt scored both touchdowns on the ground for St. James. Sammy Wheeler threw three touchdown passes to go along with 164 yards passing. Valley Center beat Andover 57-33 on Friday night. Wyatt Lange threw for 316 yards and four touchdowns for the Hornets. Keyon Saunders caught nine passes for 240 yards and four touchdowns in the win. The victory propelled the Hornets into the No. 3 seed on the west side of the Class 5A bracket. Valley Center will host Newton as the playoffs begin this week. KC Piper shut out injury-riddled Tonganoxie 28-0 on Friday night. The Pirates were led by J.J. Letcher with 159 rushing yards on 30 carries and two touchdowns. This was Piper’s first shutout of the season. The will travel to Atchison next week to begin the 4A-I playoffs. McPherson shut out Wamego 27-0 to improve to 6-2 on the year. The Bullpups have won six games in a row after beginning the season with consecutive losses. Tyson Stites ran for 111 yards and one touchdown to lead McPherson. Quarterback Casen Hoover found pay dirt twice despite only rushing for 13 yards in the game. Mulvane ran over Wellington 48-7 to improve to 6-2 on the year. Jayden Price led the way with three touchdown passes as the Wildcats built a 34-0 lead and put the game out of reach by half time. Ottawa won their district after a 48-28 win over Louisburg. The Cyclones play Fort Scott next week but have already won their district after wins over Paola and Louisburg. Ottawa led 21-7 at half and put up 27 more points in the second to break the 40 point mark for the third time this season. 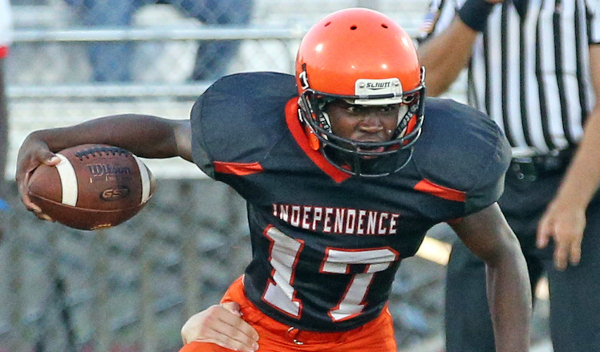 Independence improved to 7-1 on the season with a 48-21 win over rival Coffeyville. With the victory, Carl Boldra’s Bulldogs have captured their first SEK League title since 1995. Indy closes out the regular season at home with Chanute. Hugoton improved to 5-3 on the year after beating Kingman 42-17. Valentino Degollado threw for 311 yards and three touchdowns in the Eagles win. Degollado also ran for 105 yards and two more scores. Santa Fe Trail ran over Jefferson West 39-14 to improve to 7-1 on the season. The Chargers rushed for 348 yards and five combined touchdowns. Peyton Newton carried the workload rushing 24 times for 170 yards and three touchdowns. Will Herren also broke the century mark with 123 rushing yards on the night. Scott City scored touchdowns on their first four possessions and were well on their way to a 56-0 win over Goodland. Bo Hess threw for 142 yards and two touchdowns while Kevin Aguilera rushed six times for 132 yards and two trips to the end zone for the Beavers. Wichita Collegiate squeaked by Nickerson 20-18. Cody McNerney completed 15 passes for 177 yards and one touchdown, while Juston Flowers and McNerney combined for 139 rushing yards and another touchdown. Conway Springs defeated Cheney, 34-12, won the Central Prairie League title, and is in control of District 10. The Cardinals, looking for their tenth straight playoff berth, led 13-6 at halftime. However, quarterback Colton Terhune left the game in the second quarter and did not return. He finished with 105 yards rushing on the night. Trenton Jones led all rushers with 132 yards. Conway Springs held a 361-197 edge in total yards. Garden Plain was 6-0 entering District 10 play, but fighting for its season after a Week 7 loss to rival Conway Springs. The Owls defeated Chaparral, 22-14 on Friday, handing the Roadrunners their first loss. Nate Pauly rushed for three touchdowns in the win. Now, Chaparral must defeat Conway Springs next week to earn a playoff berth. Chaparral led 6-0 early before Pauly tallied a touchdown in each of the first three quarters for a 22-6 lead. Pauly tallied 17 carries for 126 yards. In District 4, Mission Valley defeated Council Grove, 49-11. It is Mission Valley’s first win against Council Grove for the Vikings’ senior class. Council Grove led 3-0 early before Mission Valley scored 49 straight points. Clay Phillips rushed for four touchdowns as the Vikings built a 28-3 lead at halftime. Phillips scored on runs of five, 24, 54 and 46 yards and rushed for 240 yards. Belle Plaine defeated Leon-Bluestem, 60-12, in District 9 action. It marked the Dragon’s second victory of the season and first home win in four years. Belle Plaine scored on the first four possessions and six of the first eight. The Dragons had 28 carries for 259 yards. Quarterback Bo Gooch complete eight of 13 passes for 159 yards and two touchdowns. Belle Plaine led 38-0 with more than five minutes remaining in the first half. In District 12, Hesston defeated Southeast of Saline for a third consecutive season. The Swathers won 34-26 to notch their fourth straight victory since a 1-3 start to the season against a challenging schedule. The Trojans were undefeated entering the contest and dropped to 7-1, 1-1 in district play. Hesston trailed 8-6 after the first quarter but took a 19-14 halftime lead and led 28-14 after three quarters. Zach Esau completed 10 0f 16 for 140 yards with two scores against one interception. Parker Roth collected 14 carries for 130 yards and two scores. SE of Saline quarterback Bryce Banks completed 21 of 30 passes for 272 yards with three touchdowns and an interception and added a rushing score. Maur Hill-Mount Academy’s Ronald Faulk-Tindal rushed for 354 yards and five touchdowns as the Ravens defeated Immaculata-Maranatha, 64-22. MH-MA clinched the District 2 title with the victory. St. Mary’s Colgan picked up a fourth consecutive win and collected the District 4 title with a 57-6 win against Oswego. Max Wilson opened the scoring with a five-yard run, and had a 15-yard interception return for a score shortly after. Colgan, then recovered an Oswego fumble on the 8-yard line and scored on the next play. Olpe defeated Northern Heights, 65-28, after the Eagles trailed 14-13 heading into the second quarter. In that second quarter, Jacob Heins blocked a punt and returned it 49 yards for a touchdown. Dylan Redeker finished with 15 carries for 207 yards and a pair of scores. Blaine Hinrichs rushed for three touchdowns as Olpe rolled up 450 rushing yards. Olpe (4-4, 1-1) will play host to Lyndon (8-0, 2-0) on Friday in a game with significant District 3 implications. In District 2 play, Valley Heights defeated Centralia for the first time since 1988 in a 51-36 victory. Hunter Stevenson ran for 187 yards and four scores. Valley Heights will play host to No. 5-ranked Washington County in a contest that will decide both playoff berths. In District 5, Sedgwick clinched a playoff spot with a 62-8 victory over Whitewater-Remington behind a 36-point first quarter. The Cardinals have reached the playoffs five consecutive seasons. Freshman Kale Schroeder raced 79 yards for a score on the first play from scrimmage. Less than a minute later, Schroeder delivered a pick-six for a 14-0 lead. He finished with 96 rushing, 64 receiving and three touchdowns. Sedgwick travels to Inman (3-5, 2-1) to close out the regular season this week. In District 7, La Crosse won its fourth straight contest and improved to 4-4o overall. The Leopards rolled over Oakley, 48-10, and clinched a playoff berth. The Leopards led 42-3 at halftime. A balanced effort yielded 30 rushes for 202 yards and five touchdowns, including three from senior Clayton Herdman and two by senior Jasey Woods (team-high 90 rushing yards). Herdman completed 3 of 4 passes for 98 yards and a pair of scores. This week, La Crosse plays host to No. 2 Plainville in a game that will decide both playoff positions out of the district. Solomon outscored Logan-Palco, 22-0 in the first quarter and eventually won by the same margin, 56-34. The Gorillas can clinch the second playoff spot out of District 4 with a win over Victoria on Thursday. Solomon can still get in with a loss, but only if Logan-Palco also defeats Bennington. For Logan-Palco, senior quarterback Josh Van Laeys completed 5 of 9 passing for 116 yards with two scores and no interceptions in the loss. Junior David Thompson rushed 25 times for 146 yards and a score. Van Laeys finished with eight carries for 72 yards and two touchdowns. Oxford rolled over winless Flinthills, 72-0, and clinched the District 2 title by virtue of wins against Cedar Vale-Dexter and Peabody-Burns. Oxford (6-2, 4-0) was 1-8 last season and has already won its most games since 2006, also the season of its last playoff berth. Oxford has averaged 47.5 points per contest. Hoxie, with no seniors, clinched a winning season with a 40-18 home win against Hill City. Hoxie led 20-6 at halftime before Hill City outscored Hoxie, 12-6, in the third quarter. However, the Indians had a 14-0 edge in the fourth quarter. Junior Latham Schwarz had 19 carries for 109 yards and four scores, and junior Troyal Burris tallied 18 carries for 109 yards and two touchdowns. Senior Holden Jones delivered 13 tackles and recovered a fumble for a score for Hill City. Hoxie is 5-3, 3-2 in District 8, while Hill City is 4-4, 3-2. The Indians’ defense has permitted just 21.3 points per contest, No. 12 in the classification. Hoxie has now posted seven straight winning seasons, of the best current marks in all of eight-man football. Caldwell rolled over South Haven, 76-6, and set up a key District 2 contest at Hutchinson Central Christian this week. Both the Blue Jays and Cougars are 7-1, 3-1. Hartford (7-1, 4-0) has won the district title. Central Christian and Caldwell are the two highest scoring squads in Kansas with 512 and 494 points. Against South Haven, Caldwell scored eight first quarter touchdowns and led 60-0. Dakota Volavka had four scores, and Colten Ward tacked on three more. Axtell freshman quarterback Quinn Buessing threw for 234 yards and five scores in a 72-40 win against Blue Valley Randolph. Hunter Koch caught all five scoring passes. Axell, a very young team this season after back-to-back sub-state showings, is 4-4, 2-2 and will conclude the season at No. 1 Hanover this week in District 3. District 5 will be one of the most compelling districts entering Week 9. Five teams are still alive for a postseason berth after Stockton defeated Northern Valley, 74-54, and Wilson defeated Lakeside-Downs, 64-40. Lakeside and Stockton are both 3-1 in district play with the Tigers hosting the Knights on Thursday. Sylvan-Lucas Unified and Wilson both follow at 2-2, while Northern Valley is also 2-2. Sylvan-Lucas is at Wilson on Thursday. The winner of Lakeside/Stockton is guaranteed to win the district. Against Northern Valley, Stockton quarterback Brady Beougher contributed five passing scores against one interception on 20 of 29 for 280 yards. He also rushed 12 times for 153 yards and a touchdown. Senior Brayden Winters tallied 12 carries for 140 yards and three touchdowns. Stockton led 34-22 after the first quarter and outscored Northern Valley in each quarter. In the last three quarters, the Tigers had margins of 16-14, 8-6, and 16-12. Northern Valley ran 84 plays, 18 more than the Tigers. The Huskies had a 535-506 yardage edge. Northern Valley quarterback Caden Kinderknecht delivered another impressive offensive performance with 14 of 22 passing for 157 yards with a 1/2 TD/INT ratio. He rushed 31 times for 174 yards and three scores. A major difference came on conversions. Stockton was 7 of 10, and the Huskies were 3 of 8. Manhattan-Flint Hills Christian outscored Cair Paravel 24-0 in the third quarter to pull away for a 60-22 victory. The Eagles led 28-14 before the deciding quarter that pushed the lead to 52-14. Senior Derek Bowman rushed for 129 yards and two touchdowns, and passed for 42 yards and another score. Andrew Reader added a pair of touchdown runs, while Dylan Peters caught a pair of touchdown passes. Alex Wyatt rushed 14 times for 242 yards and two touchdowns as Sunrise Christian Academy topped St. John’s Military 50-26. Wyatt, the Buffaloes’ junior quarterback, also passed for 71 yards and another score. Senior Nathan Kampe added 115 rushing yards and a touchdown for Sunrise. St. Mary’s Academy remained unbeaten with a 50-0 shutout of Veritas Christian. Quarterback Roy Clancy passed for 182 yards and four touchdowns to lead the Crusaders. Clancy connected on touchdown passes with Martin Isermann, Theodore Eubanks, and twice to Zachary Christensen. Clancy, Eubanks, and Anthony Riccomini also rushed for touchdowns for the Crusaders. Cheylin opened the 6-Man playoffs with a 53-7 victory over Wheatland-Grinnell. The Cougars were once again led by Manual Castillo who rushed for 141 yards and two scores. Quarterback Erik Perez completed only three passes for 141 yards and two touchdowns for the Cougars. Perez also added 97 rushing yards and a score. Carter Porubsky scored two rushing touchdowns, and caught all three of Perez’s passes for 141 yards and two scores. Cheylin will take on top-seed Weskan (6-0) in the 6-Man semifinals this week. Pawnee Heights advanced to the 6-Man semifinals with a 73-6 win over Natoma in a game played back on Monday, October 17th. The Tigers (5-2) will now advance to take on second-seeded Golden Plains (5-1) in the semifinals this week.